Most firms that offer health benefits offer only one type of health plan (85%) (See Text Box). 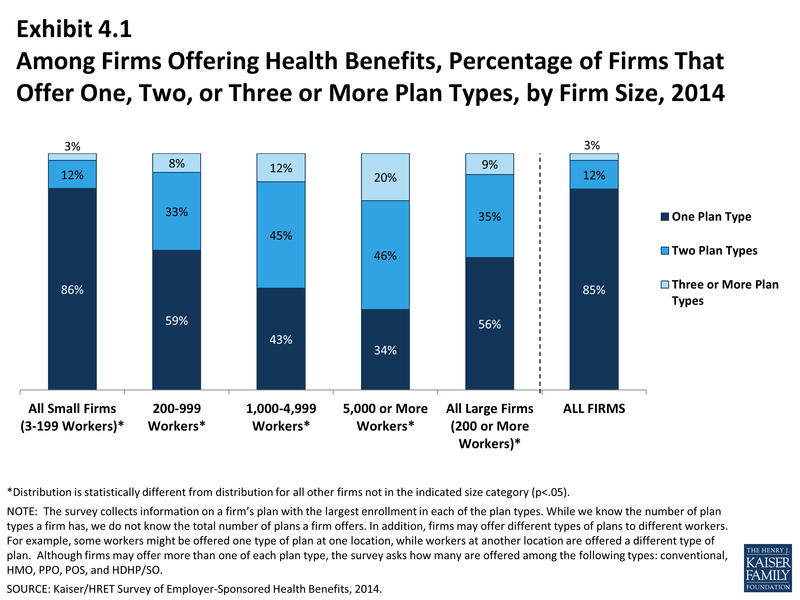 Large firms (200 or more workers) are more likely to offer more than one type of health plan than smaller firms. Employers are most likely to offer their workers a PPO or HDHP/SO plan and are least likely to offer a conventional plan (sometimes known as indemnity insurance). Eighty-five percent of firms offering health benefits in 2014 offer only one type of health plan. Large firms (200 or more workers) are more likely to offer more than one plan type than small firms (3-199 workers): 44% vs. 14% (Exhibit 4.1). 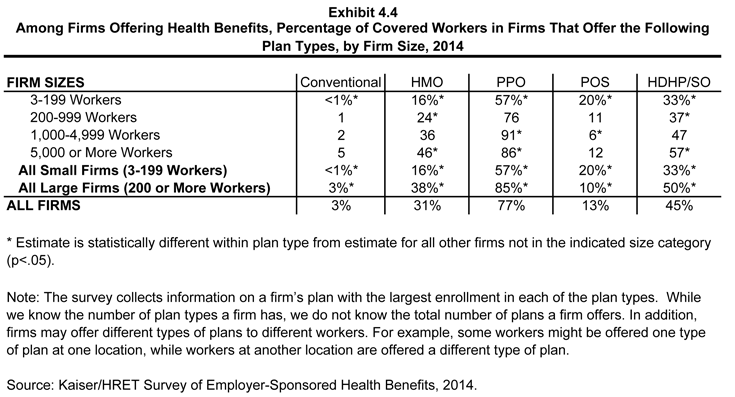 In addition to looking at the percentage of firms which offer multiple plan types, the percent of covered workers at firms which offer multiple plan types can be analyzed. 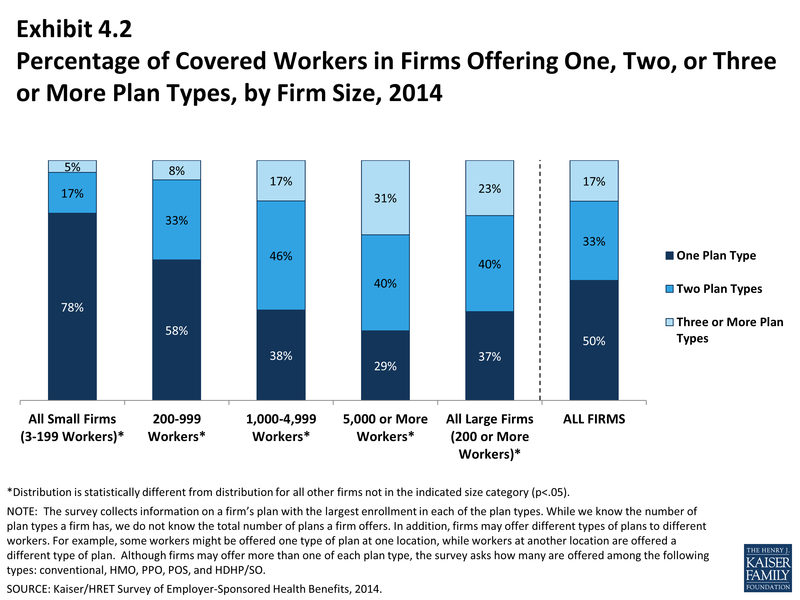 Half (50%) of covered workers are employed in a firm that offers more than one health plan type. Sixty-three percent of covered workers in large firms (200 or more workers) are employed by a firm that offers more than one plan type, compared to 22% in small firms (3-199 workers) (Exhibit 4.2). 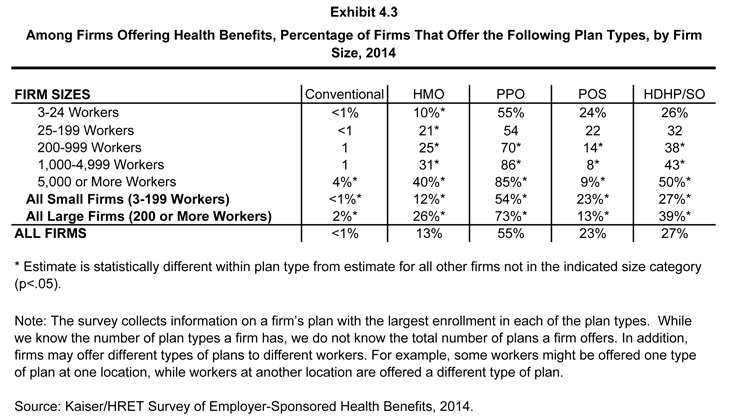 Among firms offering only one type of health plan, large firms (200 or more workers) are more likely to offer PPO plans than small firms (3-199 workers) (71% versus 49%), while small firms are more likely to offer HMO (8%) and POS (20%) plans than larger firms (2% and 5%, respectively) (Exhibit 4.5). Eleven percent of covered workers are covered at firm which only offers an HDHP/SO. The survey collects information on a firm’s plan with the largest enrollment in each of the plan types. While we know the number of plan types a firm has, we do not know the total number of plans a firm offers. In addition, firms may offer different types of plans to different workers. For example, some workers might be offered one type of plan at one location, while workers at another location are offered a different type of plan. HMO is health maintenance organization. PPO is preferred provider organization. HDHP/SO is high-deductible health plan with a savings option such as an HRA or HSA.